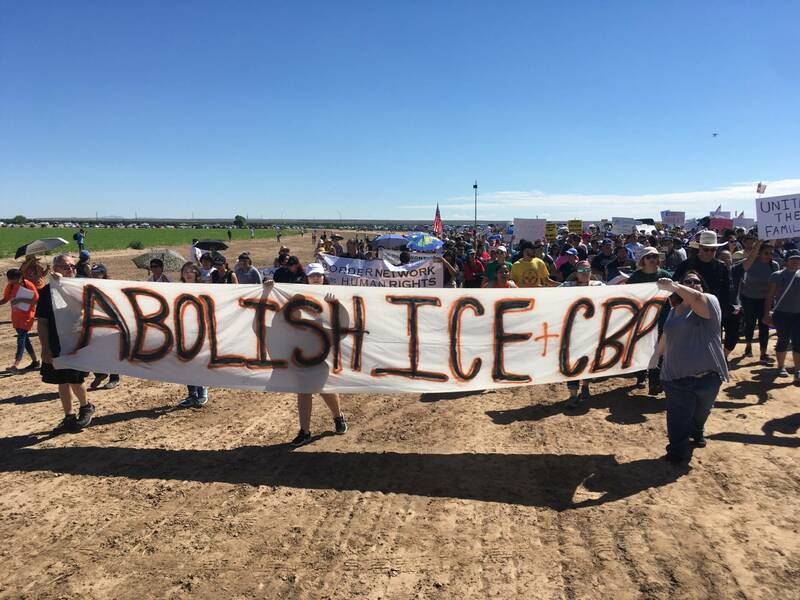 More than 2,000 protesters marched Sunday in Tornillo, Texas, where more than 100 teenage boys detained by U.S. Customs and Border Protection for immigration violations are being held in tent encampments. 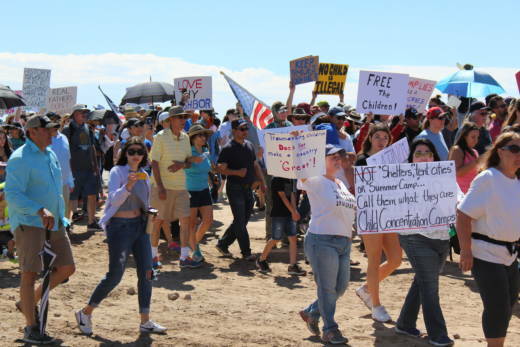 The Father's Day march in Tornillo, about 40 miles southeast of El Paso, was led by Texas Democratic Rep. Beto O'Rourke. O'Rourke confirmed to KQED that the Tornillo facility could eventually hold up to 4,000 boys. He also confirmed that among the boys held at the Tornillo facility are those who arrived at the U.S.-Mexico border with their parents, but were separated from them under the Trump administration's policy on immigration. Demonstrators chanted, "We will not go away. This is not OK," and they carried signs saying, "This is not right," "Traumatizing children does not make a country 'great,' " and "Free the children." Tyler, who did not want his last name used, told KQED's John Sepulvado that he had flown in from Los Angeles Saturday night to take part in the demonstration. "This policy of cruelty as a deterrent is awful," he said. "It's terrible, and I can't stand for it." The announcement last week to open the Tornillo tent encampment came as the Department of Homeland Security said 1,995 minors had been separated from their "alleged adult guardians" along the U.S.-Mexico border during a six-week period from April 19 through the end of May. The government says more than 10,000 children are in shelters run by the Office of Refugee Resettlement. But in a conference call with reporters Friday afternoon, administration officials with the Department of Homeland Security and the Department of Justice defended the policy as a means of implementing the policy of "100 percent prosecution" of illegal border crossers. Texas state Rep. Mary González wants to see more lawyers come to her district, where Tornillo is located. "El Paso doesn’t have a lot of lawyers. Tornillo, Texas has no lawyers, right? We’re talking about rural Texas," González said. González is one of the few people to tour the tent encampment, and she says there is a tremendous need for legal advice. "And here’s the thing – in April, [Attorney General] Jeff Sessions changed this from being civil to criminal," González said. She's referring to a new Justice Department policy to criminally prosecute first-time offenders who crossed illegally into the U.S. Those undocumented immigrants were generally deported in civil proceedings. "And so a lot of immigrant rights attorneys were doing this in civil courts. In conversation with them, they say 'We need criminal lawyers to come and help us, because we’ve never done this before,' " González said. Meanwhile, some 35 Department of Justice attorneys have been dispatched to the border to prosecute these cases. 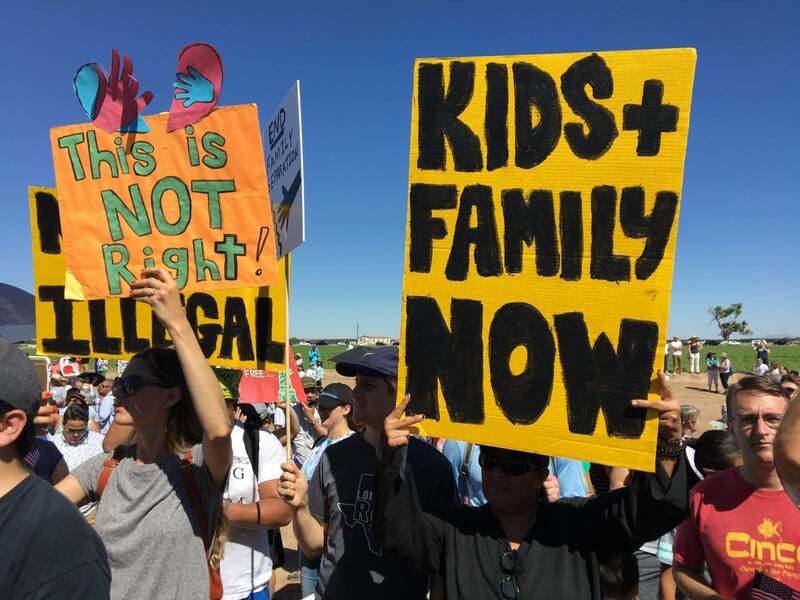 Several prominent pediatricians have said putting children in tent camps in the Texas desert during summer could create serious physical and mental conditions. Dr. Colleen Kraft is president of the American Academy of Pediatrics. She says the younger the child, the greater the health danger -- as younger children are less able to express their needs in the hot desert climate, and are more stressed by parental separation. "And this contradicts everything we know about building child health," Kraft said. "And when this is done in an intentional sort of way, what is it but abuse?" Marfa Public Radio contributed to this report.